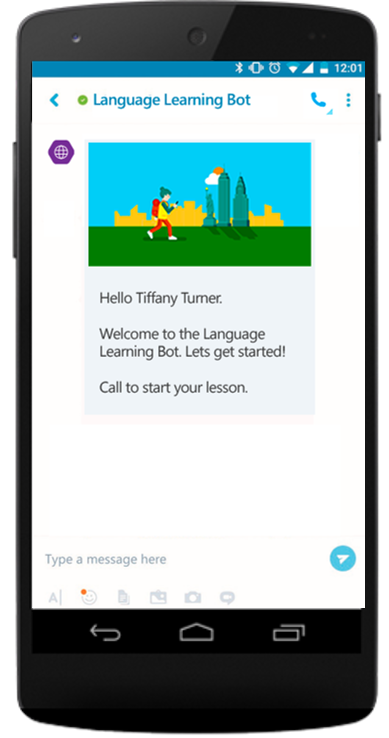 Eton Institute, along with partner company Learningonline.xyz, collaborates with Microsoft to create a language teaching bot for Skype users. Dubai, 19th January 2017 – In 2016, Microsoft introduced a new world of conversational computing-where conversations become the new platform. This paradigm shift is enabling machines to harness the power of human conversation, leading to endless improvements in efficiency, intelligence and, of course, fun. Since the emergence of conversational computing, there has been an ever-growing presence of bots. More than creating efficiencies or entertaining experiences, bots are also pushing the boundaries of education for consumers. Skype, in collaboration with Eton Institute and partner company Learningonline.xyz, is developing a bot that can teach users a new language. Coming soon, this new tool is just a fraction of what will be possible with this emerging technology. While still in the early days of innovation, this tool is truly changing the way a consumer accesses and engages in language learning. As a leading language training institute from Dubai, UAE, Eton Institute will offer their specialized knowledge of languages to the production of the language teaching bot for Skype, therefore ensuring the users with effective and efficient resources for distant learning. Currently, approximately 10,000 companies are developing bots to maximize their potential and productivity. The increased intelligence of bots and the creation of a two-way communication between the user and the interface is the ultimate platform to achieving language proficiency. Eton Institute operates with the understanding that languages, communication and culture are fundamental to the human experience and necessary for individuals’ and organizations’ future success. Offering solutions in over 160 Languages since 2006, it has helped thousands of individuals and companies resolve communication challenges through customized solutions, with operations in the UAE, UK, USA, Hong Kong and India. Eton Institute has developed unique, proven engagement methodologies and techniques, and is proud to be associated with top international organizations, to successfully connect people and global businesses to opportunity. Eton Institute is an Approved Center for the delivery of Cambridge Exams, TOEIC, DELE, ÖSD, CILS and a test venue for the IELTS exam. Additionally, all language courses offered by Eton Institute are EAQUALS-accredited and meet Common European Framework of Reference (CEFR) standards set by Council of Europe.